Welcome to the website of Boy Scout Troop 1, headquartered in Radnor, Pennsylvania. The site includes calendars of upcoming events, pictures from recent trips, and more useful information. Look here for information on upcoming trips – packing lists, meeting times and places, etc. Paoli Troop 1 Boys Scout of America was founded at the Good Samaritan Church in Paoli and was originally chartered in New York City in March 1911. 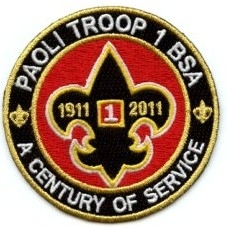 Since it was the first Scout Troop in the area, it became Paoli 1. The Troop has kept this name despite its move to suburban Wayne in 1924. The Troop’s first Scoutmaster, the Reverend Horace A. Walton, was pastor of the church. There were only two scout patrols, at the founding of the Troop, the Wolves and the Lions, and most of the early Scouts were members of the choir. In 1915, the Colour Patrol was organized with special privileges in guarding and carrying the colors of the Troop. The Eagle Patrol was added in 1919. In keeping with the historic nature of the patrols, the Troop continues to retain these four patrols. The Fox Patrol, originally formed around 1926, is periodically re-activated during periods of large Troop membership. The Troop’s Drum and Bugle Corps, originally a separate patrol, was established in the 1920’s. The Troop participates in the Wayne/Radnor Memorial Day Parade each year. The Paoli 1 grounds are located at 1038 Radnor Road, Wayne, PA 19087.